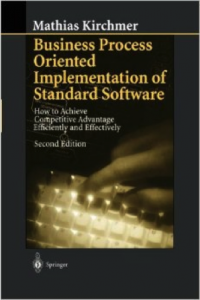 Kirchmer, M.: Business Process Oriented Implementation of Standard Software – How to Achieve Competitive Advantage Efficiently and Effectively. 2nd edition, Berlin, New York and others 1999. Here, the author, an SAP R/3 expert and president of a consulting firm, shows readers how companies can achieve strategic goals through business process oriented implementation of software such as SAP R/3, Oracle, or Peoplesoft. The updated second edition of this best-selling title will help managers and consultants understand the necessary methods and tools.